The RP-Vita, developed by InTouch Health in partnership with Roomba maker iRobot Corp. and cleared by the Food and Drug Administration in 2013, is the first to use autonomous navigation technology. A growing number of hospitals are deploying robots that automate simple operational tasks or provide new ways for physicians to interact with patients beyond the bedside. Healthcare providers say that the robots—or machinery with varying types and degrees of robotic automation—can help reduce costs, make operations more efficient and serve as a marketing tool to position hospitals as early adopters of cutting-edge technology. Yet questions remain about whether the pricey new technology can deliver on those promises. It's becoming more common, for example, to see Tugs, made by Pittsburgh-based Aethon, humming around U.S. hospitals, using elevators to move floor to floor as they haul drugs, linens and lab results. They replace the role of runners previously responsible for such deliveries. Denver-based Swisslog Healthcare Solutions-North America's RoboCouriers carry out many of the same tasks. The robots that have joined the U.S. hospital workforce tend to fall into two categories: ones that replace a job previously handled by an employee, such as packaging drugs or delivering lab results, and telemedicine-based technologies that connect clinicians and patients in ways that previously didn't exist. Adoption has generally been limited to academic medical centers, which are more likely to have the scale, budget and operational mobility to invest in the technology. Robot manufacturers and some providers say that broad efforts to improve clinical quality and reduce costs may boost utilization of these robots over the next few years and could spur new development of more innovative tools that will help hospitals become further automated. GE Global Research announced this year that it will work with the Veterans Affairs Department to develop an intelligent system that will sort, sterilize and track surgical tools. The system is expected to be tested at a VA hospital in 2015. “We're uniquely positioned to construct a smart solution that can make operating rooms run more efficiently, save millions of dollars in healthcare costs and lead to better patient outcomes,” Lynn DeRose, principal investigator and auto-ID technology expert in GE Global Research's distributed intelligent systems lab, said in a news release. The promise of better outcomes, including reductions in medication errors, has triggered interest in pharmacy automation robots, such as Intelligent Hospital System's RIVA and McKesson Corp.'s Robot-Rx. The robots take on tasks such as breaking down drugs into unit-of-use doses or expiration dating. Like the delivery robots, they, too, can reduce labor costs. The VGo acts as a personal avatar—or, as the company says, “replicates a person in a distant location”—via the robot's camera, microphones and video display. The remote user can move the VGo around a facility. The robot has applications in telemedicine, and the company also pitches it to hospitals and nursing homes as a way for family members to virtually visit their loved ones. St. Mary Medical Center, a 165-hospital in Long Beach, Calif., that is part of Dignity Health, bought the McKesson robot more than a decade ago. The only errors that can occur now are human errors, said Catherine Hirokawa, St. Mary Medical Center's director of pharmacy. Other systems, such as Xenex's room disinfection system, which can kill Clostridium difficile and methicillin-resistant Staphylococcus aureus, take on another chief concern of hospitals: infections. Those systems are also often marketed as robots, although they lack the automation typically associated with the term. Adoption of robotic automation will likely hinge on whether hospitals are convinced the technology meaningfully addresses their top concerns, such as medication errors, infections and rising labor costs. The market for these robots is still fairly new. 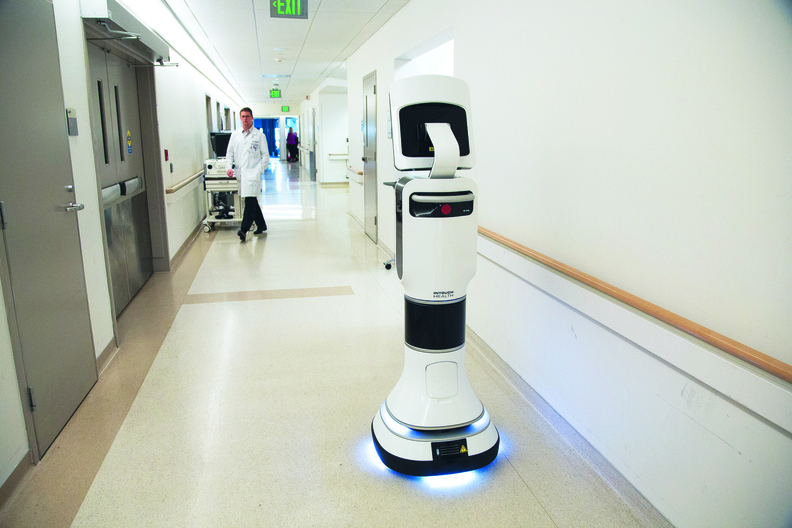 While academic medical centers and large health systems have been early adopters of robot technology, smaller hospitals have been less likely to invest in robots, which can, in some cases, cost more than $1 million. Some robot manufacturers, though, are starting to report the new technologies are making their way into some of those hospitals. 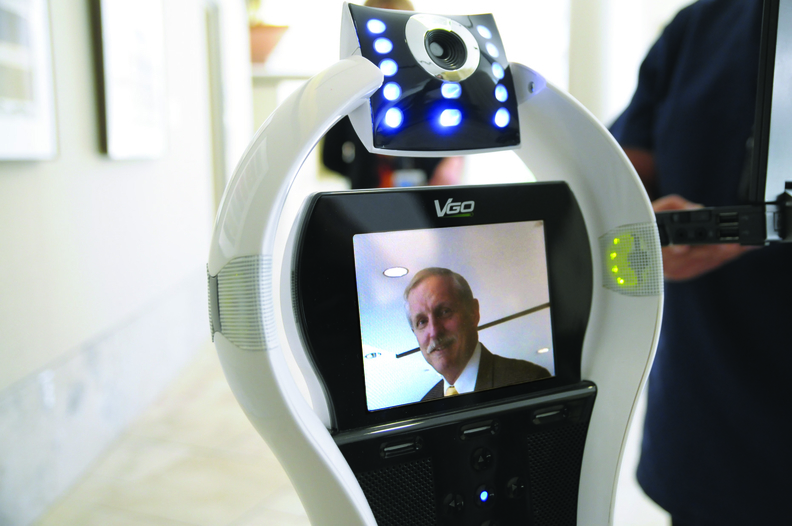 About 800 hospitals in the U.S. are using telemedicine systems, including two robots, that have been developed by InTouch Health, a Santa Barbara, Calif.-based telemedicine developer. Those robots are usually incorporated into telestroke or tele-ICU programs and are often used by smaller hospitals to connect patients with specialists. Dignity Health's Mercy San Juan Medical Center, a 359-bed hospital in Carmichael, Calif., is one of about a dozen hospitals in the U.S. to acquire the RP-Vita since it entered the market this year. The Food and Drug Administration cleared the RP-Vita's autonomous navigation feature in January of this year, according to a company spokeswoman. InTouch Health's Chairman and CEO Yulun Wang said he “would expect the majority of hospitals to have this type of technology” over the next three to five years. The adoption, though, requires hospitals to address the impact on its traditional workflow and can raise additional questions about reimbursement and increased interaction between providers. The healthcare industry has been slow to move toward robotics even as other industries have moved forward with adoption. But, as more providers seek out new ways to reduce costs and improve efficiency, some automation and telemedicine tools may help. “We're still at such an early stage of figuring things out,” Whelan said.